The QMI Rocker Panel Trim will make your vehicle a definite head turner. Made from high-quality mirror-polished stainless steel, installing a set of QMI Rocker Panel Trims will significantly increase the WOW factor of your ride, while giving your rocker panels everyday protection from stone chips, chipping, rust and pitting. QMI Rocker Panel Trims are designed to be weather-resistant and corrosion free. Perfect for the summer and extremely helpful in the winter. Protects and beautifies your vehicle rocker panels without unnecessary drilling that can cause paint and metal damage. QMI Rocker Panel Trim will protect your rocker panels from rust and paint chips. Made from high-grade mirror-polished stainless steel for a lasting and durable shine. Easy to install, NO drilling and NO special tools are required. Comes pre-installed with industrial-strength 3M adhesive tape. Simply peel off the protective tape and stick on the rocker panel of your vehicle. Each rocker panel trim is custom made for a wide array of cars, trucks and SUVs. NO bending, NO cutting, NO screws required. Protects and beautifies rocker panels at a much lower price. Get the customized look on your ride, at a price you can afford only at Sam’s Motorsports. Did you know that your vehicle rocker panels are prone to everyday hazards such as paint chips, rust and corrosion? Protect your rocker panels while adding a luxurious look to your vehicle by simply installing a high-quality set of QMI Rocker Panel Trims. Sam’s Motorsports carries an impressive array of QMI Custom accent trims for every car, truck or SUV. We have QMI Chrome Accent Trim, QMI Window Sill Trim, QMI Front Bed Caps, QMI Stainless Steel Fender Trim, QMI Side Molding Overlays, QMI Stainless Steel Gas Door Covers and a whole lot more. QMI stands for Quality Merchandising Incorporated from Carson City, Nevada. QMI is your premiere custom truck and accessory company, offering a wide array of custom fit chrome accessories and quality wood trim for any conceivable nook and cranny of your car, truck or SUV. QMI Chrome Accent Trims are made from only the best materials and high-grade mirror polished stainless steel. QMI custom accessories are known for their outstanding shine and durability. Each QMI custom auto and truck accessory is guaranteed to perfectly fit any type of vehicle, whether domestic or imported. 1992-1999 Buick LeSabre QMI Rocker Panel Trim, The QMI Rocker Panel Trim is designed specifically to fit your 1992-1999 Buick LeSabre without any modification to your beloved Buick LeSabre. 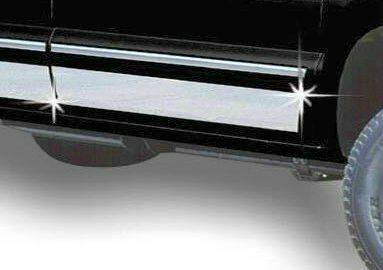 If this QMI Rocker Panel Trim is not exactly what you are looking for to accessories your 1992-1999 Buick LeSabre, please don't give up just yet. Our catalog has huge variety of parts and accessories for your Buick LeSabre.